It’s a modern film noir set in the ‘50s (great looking cars :) with a heckuva cast – Russell Crowe, Kevin Spacey, Guy Pierce, Kim Bassinger, James Cromwell, Danny Devito, and more. There’s corruption, twists, turns, and a few cops eventually trying to do the right thing as they just can’t let the Night Owl murder case go. 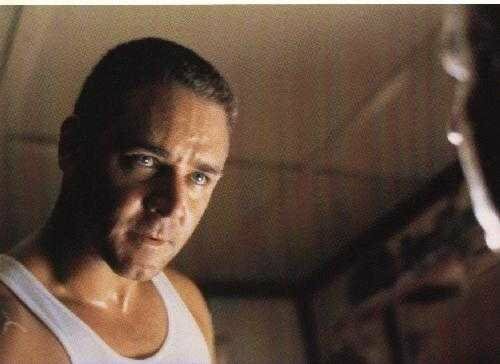 My favorite character is Bud White, played by Russell Crowe. He’s an old school, tough cop, who knows his limitations. He doesn’t think he’s smart, but he is and figures it out and makes his stand. As a side note, watching Crowe play this part, I can easily see why comic fans at the time of the casting of the first X-Men movie were nominating him to be the one to play the part of Wolverine. Of course, Hugh Jackman got the role, and I can’t really see anyone else doing it but him. However, I think Crowe would have done an excellent job, but I don’t think he would have ever taken the part at the time. Comic book movies had yet to reach the blockbuster status they enjoy now, which ironically, the first Blade and X-Men movies opened the door for. Comments on "Me-Mini Movie Reviews: L.A. 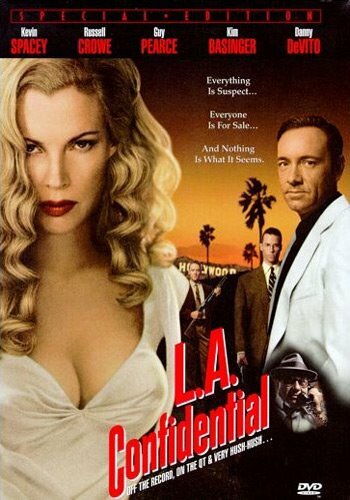 Confidential"
Enjoyed your take on L.A. Confidential and thanks for your comments on my web page.